This 10ft wavy slide is a Smyths Toys Superstores exclusive. 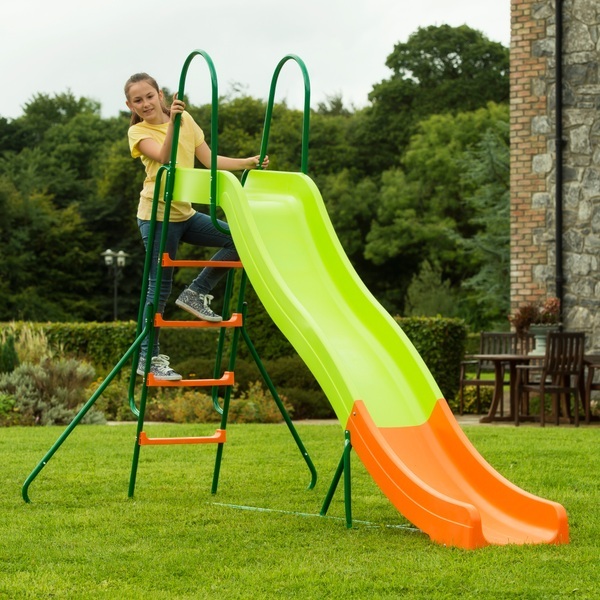 The bold green and orange colours of this slide are perfect for adding a bright splash of colour to your garden. This slide is sure to get the kids playing outdoors. It has 10ft to whizz down and features a double wave for double the fun. The 10ft wavy slide features plastic moulding so kids can play in comfort. The four sturdy steps provide safe and easy access to the top of the slide. The dark green handrails along both sides of the steps and at the top of the slide help children to climb the slide in confidence and safety. The width of the frame allows children up to the age of ten to play, while the high sides make sure that your children can be safe and secure as they slide. The slide is equipped with ground pegs to provide extra stability and ensure an even safer playtime. This secure and fun slide is a great addition to outdoor play. The 10ft wavy slide is suitable for children aged 3-10 years. Unassembled, the side fits in most cars.